Home SEND SEN Reforms Changing to an EHC Plan? Time frames are changing. Changing to an EHC Plan? Time frames are changing. A few weeks ago, we posted about what to expect when transferring from a Statement to an EHC Plan. In the post, we discussed the confusion over whether there was 14 or 16 weeks for the Local Authority to effect the change. Well, on Friday at the ADCS conference, (just to clarify things/confuse more people), Ed Timpson announced that as they had heard from many people that adhering to the time frame was proving challenging, the time frame would now change to 20 weeks. We are waiting for the details but we are presuming this means the LA must give two weeks notice of the transfer assessment starting and then 18 weeks for the transition to take place. A letter was sent to each Local Authority yesterday to advise them of these changes. 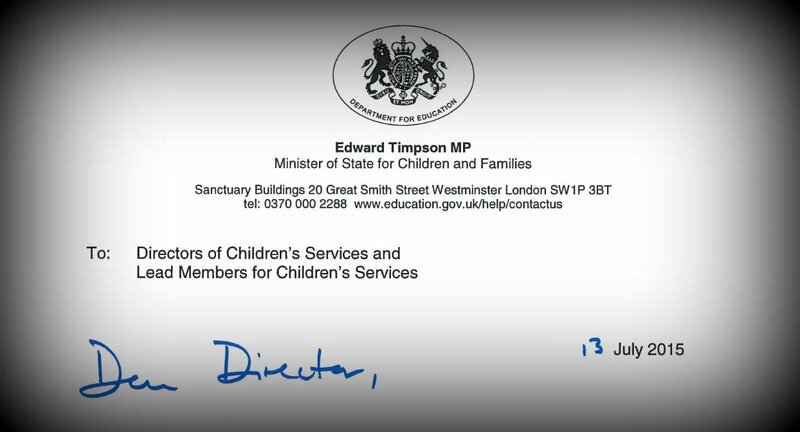 One extra clarification was that "simply rebadging statements and LDAs as EHC Plans isn't an option" so if you are told that the LA/school intends to just transfer the details from your current statement to the EHC Plan, show them the letter from Ed Timpson. Transferring Statements and LDAs to EHC plans is a significant task that needs to be done well. Simply rebadging statements and LDAs as EHC plans isn't an option. We need to ensure that the needs of children and young people are properly identified and met. I've been keeping in close contact with local authorities as they have been putting the SEN and disability reforms into practice and listening carefully to the feedback received from professionals and families alike. I have heard that the current timescales are putting a strain on the system that risks undermining the quality of person-centred assessment and EHC plans. We need to ensure that the needs of children and young people are properly identified and met through the provision you put in place; and that the processes enable you to undertake the task efficiently and to a high standard. This change is to be effective from September 2015. So if you are transferring now or have been since September 2014, the 16 weeks still applies. The DfE will be extending the maximum timescale for transferring individual Statements from 16 to 20 weeks; matching the timescale for new assessments. This will take effect from 1 September 2015. Ofsted and the Care Quality Commission [CQC] have been asked to inspect how well local areas are doing in making sure these reforms are really delivering for children and young people. Ofsted and the CQC will consult on their plans over the summer. Why is the DfE making these changes? This isn’t and it mustn’t be about drift. Where it suits a family’s needs, I would still expect the transfer to happen more quickly. But where transfers are more complex, it makes more sense to take a little longer to get it right. Because, as I say, in our efforts to move to the new 0 to 25 SEN system, we can’t stint on quality, especially at the crucial assessment stage. As welcome as this is, it is fairly apparent that many LA's are using their own time frames anyway. When we asked families about their experience, we found very few families who had managed to transfer within the 16 weeks and many more who were way over the 20 weeks new time frame suggested - including those of us at Special Needs Jungle. Will it make any difference to families? We're not sure. Until accountability becomes the focus for the DfE and more importantly, accountability with consequences, then possibly not. We need accountability without a tiered complaints system for families to battle through. Now that would be an announcement we would love to be sharing with you. Agree totally with your “SNJ thoughts…”. There is no consequence for the LA in missing the deadlines so it’s pretty irrelevant whether its 16 or 20 weeks! That’s the issue isn’t it? As long as there are no consequences for not complying with legislation, then we will continue to have Local Authorities doing whatever they like. Not too sure why he says ‘matching the timescale for new assessments’ – with a new assessment up to 6 weeks can be used in deciding whether to assess, and if LAs use those 6 weeks they are only left with 14 weeks to assess, write EHCP etc. So, assuming that for transfers 2 weeks of the 20 is notice period, LAs potentially have 4 weeks longer to carry out assessment with a transfer than they do with a brand new request!